As soon as I saw this dog I knew I had to fold it! I love simple models! 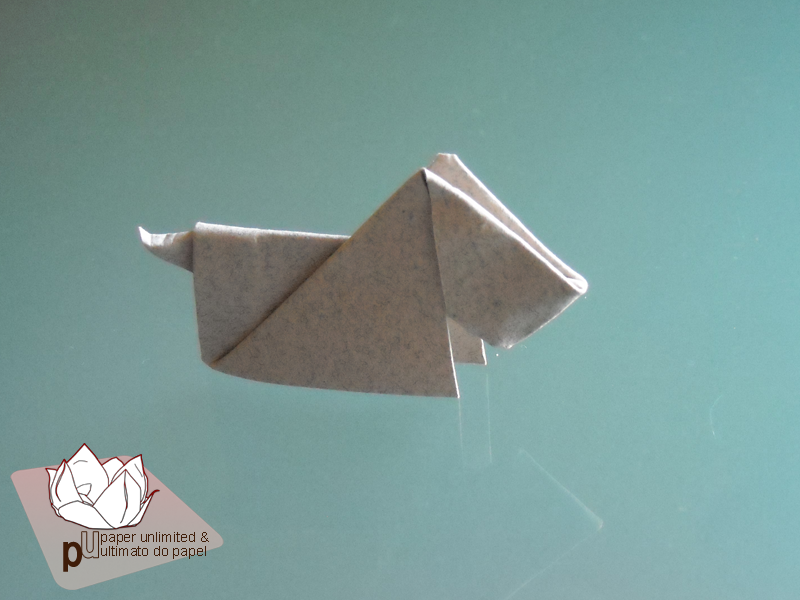 This model captures the essence of a scottie dog and is quick to fold. And easy! What can possibly top that? I was planning on folding it with brown canson paper. I know I have some. Somewhere. I must’ve had stored it away to protect it. Having a cat and humidity next to paper insures a short life span. Adding to that, the more expensive the paper the more my cat likes it. Back to the paper, I couldn’t find it so I went with the first square cut paper I found: a beige grayish canson and a blue grayish paper which name eludes me at the moment. After that I found black paper and so a black scottie was born. I love the black scottie! Dark colors suit this model well! I misread the diagram the first time so I made one extra fold that is quite visible on the first photo, on the bigger scottie. Oh, please do not be like me and actually ensure that the paper you use is square. My squares weren’t completely squares (they were off by a millimeter or so in smaller papers and by 2 or 3 millimeters on the bigger paper) so one of the ears of the scottie isn’t as pointy as it should be. In *all* models. You should always verify that the squares you cut are indeed squares. And so should I! Scottie is authored by Marc Kirschenbaum. More information on the model: a 6.5×6.5cm / 2.55×2.55″ square becomes a 3cm / 0.8″ tall by almost 5cm/ 2″ tail to muzzle scottie. Wet folding offer good results because the final model does not open up. As long as it dries prevented from opening up, that is! I use a strip of paper, secured with tape, for that. Drying complete, strip away. Hmn, nice wording. This diagram is available online! You can see the diagram by clicking at the preceding sentence. I recommend dark colours and wet folding for this model but as long as you use a paper you like and enjoy folding anything is fine. Happy folding! As usual, but even more than usual, I’ve been busy. That’s why there’s such a gap between posts! Now I’m taking any coffee break I can to post about models I have been folding. That or you get a post a year and that’s a no-no! I’m just using paper leftovers, already cut in small squares, to fold models I like. Models simple enough to be foldable in little time. Since I like simple and small models it works fine. A back to basics or a less is more kind of approach. 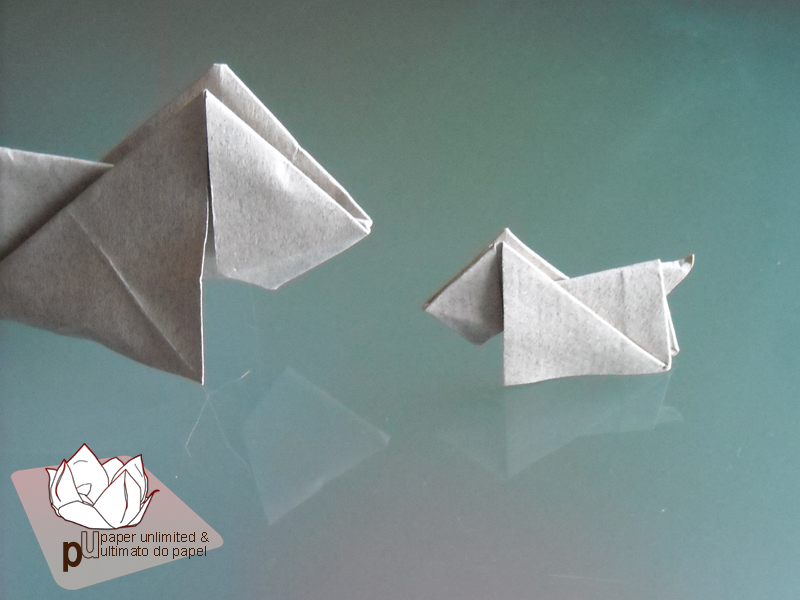 So, busy people out there who like origami, these posts are for you! These models are perfect for beginners too! They require little paper, little time and are easy to accomplish. Great to boost your confidence, add some nice folded figures to your collection or to give away! 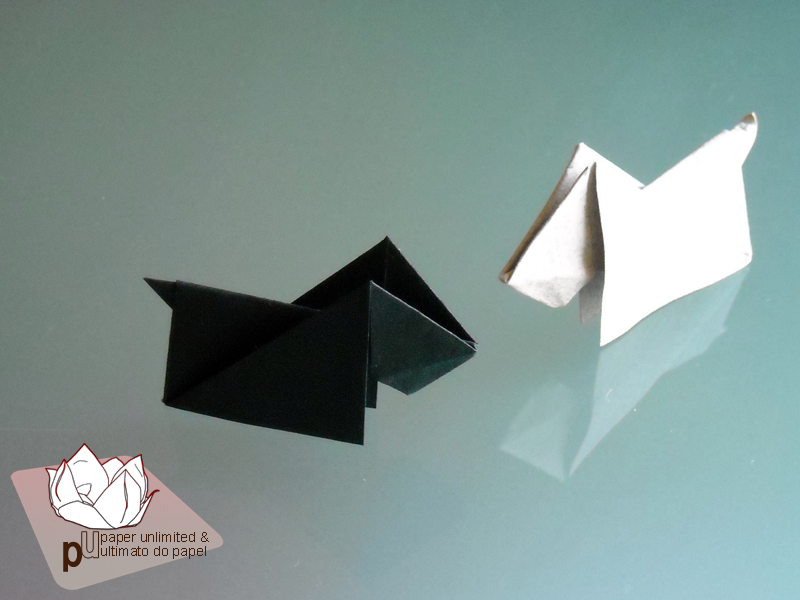 This entry was posted on 2012|03|10 at 16:52 and is filed under diagrams, origami, wet folding. You can follow any responses to this entry through the RSS 2.0 feed. You can leave a response, or trackback from your own site. Hi, I hope you don’t mind that I featured one of your projects on my blog. Gostaria de enviar uma informação mas não consegui descobrir um endereço de email. O meu é quadradinhosdepapel@gmail.com. Cute little dog ^^. I have been doing lately kusudamas designed by Ekaterina Lukasheva. This scottie is the creation of Robert Neale.